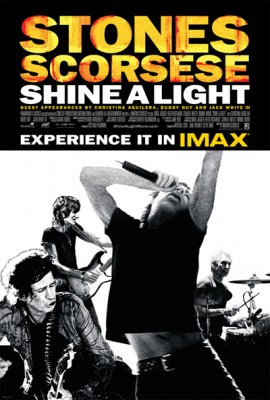 Watching Martin Scorsese's new Rolling Stones concert documentary, Shine A Light, one has to wonder if anyone would notice if Mick Jagger had a seizure. Up on stage, the man never stops moving; and he is darn cool. His exuberance in getting every member of the crowd involved in the fun is a joy to watch. And he’s 65 years old. Keith Richards, Ronnie Wood and Charlie Watts share his enthusiasm in their own ways; even in old age, Shine A Light proves that the Rolling Stones are still on top of their game. Shine A Light is essentially a concert movie, filmed during the band’s two-night gig at the New York’s Beacon Theater in November 2006. Martin Scorsese, a huge fan of the band (he’s used their music in most of his films) was there was a truckload of cameras to capture it all. His enthusiasm for making a great concert film is matched only by the Stones’ enthusiasm for music. The first ten minutes of the film show a semi-fictional account of Scorsese making sure everything is right for the filming of the concert, and the Rolling Stones getting ready to perform. There’s some very funny stuff in this segment, including a running gag of Scorsese not having the concert set list; the segment is shot mostly in black and white. And then the concert starts, the film explodes into color, and Keith Richards starts ripping into the opening guitar riff of Jumpin’ Jack Flash. The rest of the movie is the concert, interlaced with archival footage of the Band in interviews. These old interviews are placed into the film with genius precision; after two fast-paced songs, the film cuts to a young Mick Jagger being interviewed about the band being around for two years. He’s asked how much longer the band can continue, and he says he thinks they’ve got enough gas for at least another year. But the star of the film isn’t those little touches that Scorsese adds; they add a lot to the film, but the star is the concert. At the Beacon Theatre concert, the Stones are on top of their game. Every guitar line Richards and Wood play rock the house, Watts’ drumming is slick and crisp, and Jagger delivers the vocals while jumping around the stage like a chipmunk. Right off the bat, you’re enthralled. And Scorsese’s camerawork matches the Stones’ enthusiasm blow-for-blow. I don’t know how many cameras Scorsese used, but whatever the case, the cinematography is amazing. The cameras swoop, dive, pan and zoom to bring the Stones to the screen in a bold new way. Each song feels like it’s a music video filmed over a few days; but it was shot live, and some of the shots achieved are astonishing. The editing plays no small part, putting together dozens of angles into awesome number after awesome number. I think it’s no secret that Scorsese is a visionary director, and his vision for a Stones movie is perfectly realized. A concert movie has to have great sound, and the audio mix in this movie is mind-blowing. Crowd noises come from the speakers at the back of the theater, while the band’s music hits you from the sides and the front. When Richards and Wood get going on huge guitar riffs, one of them will be playing out of the left side of the theater while the other plays on the right. The front speakers often hold backup vocals and instruments; the experience is an all-inclusive audiophile’s dream. There’s plenty of songs, but the pacing of the movie is steady. It never gets too long, which is a risk in a concert feature. Whenever the enthusiasm of the Stones begins to overwhelm the viewer, Scorsese cuts to an archival interview, which usually sheds some light on the Band, their style, and their career. This is utilized the best when Richards takes over for Jagger on vocals for two songs. On his second number, it cuts back to interview right after Ronnie Wood joined the band, and sheds some great light on the career and style of both Richards and Wood. Guest artists also accompany the Stones on a few songs, just to add to the mix. Jack White appears early helping with Loving Cup, and Christina Aguilera near the end on the song Live With Me. Neither of them totally fits the Stones style, but it’s a fun variance. The best guest artist is Buddy Guy, who joins the band on Champagne and Reefer. With him in the mix, it becomes one of the film’s best sequences. Shine A Light isn’t revolutionary; nor is it really a “film” in the classic sense of the word. My A- rating doesn’t mean it is a must see classic, but that the film succeeds in every area it attempted to do so in. Scorsese wanted to capture the energy and power of the Stones on film, and he did in an amazing way. This film is 2 hours of pure satisfaction; it’s one of the most fun experiences I’ve had at the movies this year so far. I’m not a huge Stones fan, and I was glad to see that the film was so much fun for a casual fan like myself. If you harbor any love for the band, then this film is definitely worth a watch. See it in theaters, because the experience will be diminished on DVD.